Throughout his secular or spiritual life, the lay or religious yamabushi receives initiations which are some times comparable with true sacraments of Kings. 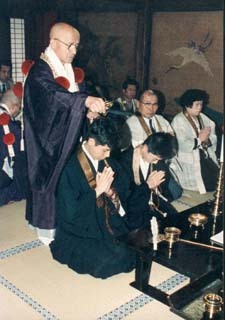 Initiation (Kanjo) is a ceremony of first importance in Japanese Tantric Buddhism which crowns the kings of the Law; perhaps less so for shugendô, which comprises a lesser number than Shingon and Tendai schools. The Master Zémui (Cubhakarashimba), Indian Master of the Chinese Master of the monk Kukai, expresses himself thus in his Great Comment: "If initiations are not received, one cannot include/understand the authentic words (mantra), the seals of hands (mudra). For example, just as for the kings reigning in countries of this world, one gives to the heir the initiation so as to ensure the line... to ensure proper understanding and prevent confusion of the Buddhas teaching, one pours on their head the nectar of the water of the Law of the 5 oceans. It is a means of salvation and it is venerated by the many Saints (Bodhisattva) because those who receive it do not continue in the cycle of samsara. roughout his secular or spiritual life, the lay or religious yamabushi receives initiations which are some times comparable with true sacraments of Kings. Initiation (Kanjo) is a ceremony of first importance in Japanese Tantric Buddhism which crowns the kings of the Law; perhaps less so for shugendô, which comprises a lesser number than Shingon and Tendai schools. The Master Zémui (Cubhakarashimba), Indian Master of the Chinese Master (Keika Ajari) of the monk Kukai, expresses himself thus in his Great Comment: "If initiations are not received, one cannot include/understand the authentic words (mantra), the seals of hands (mudra). For example, just as for the kings reigning in countries of this world, one gives to the heir the initiation so as to ensure the line... to ensure proper understanding and prevent confusion of the Buddhas teaching, one pours on their head the nectar of the water of the Law of the 5 oceans. It is a means of salvation and it is venerated by the many Saints (Bodhisattva) because those who receive it do not continue in the cycle of samsara. Infallibly, they perpetuate the dignity as if they were a King of the Law themselves. There are several types of initiations; the one referred to in this comment of Zémui is the Initiation known as of Bonds of Salvation (Kéchien kanjo) which is always given to the large pagoda of Koya san in the school of Shingon Buddhism (thus of Shugen of the Daigo temple). The first part, that of the mandala of Taizokai, is transmitted in the spring. The second part, that of Kongokai mandala is transmitted in the autumn. Even the lay practitioners are now allowed to receive it. This initiation is the first of the great family of initiations which supposes the choice of a place, the construction of a fire altar, a rite with mudra and mantra: Initiations by facts and acts (Jigyô kanjo) in which initiation with the Seals (mudra) itself is named: Impô Kanjo. In the group of initiations where the construction of a fire altar is necessary, there is undoubtedly that which crowns a Master of esoteric buddhism, the initiation known as of transmission of the Law: Dempô Kanjo. It depends on the particular school; it is granted at the end of the novitiate in the Shingon school, after the 3 months of studies and practices of the basics of the 4 ways: Shidô-kegyo. It is given much later in Tendai, at the end of ten years, judging that one needs many years of studies and serious practices to fully Master the esoteric buddhism in this branch of the Master Enchin, who gave to the Tendai school all its letters of nobility relating to the esotericism. And even later in the shugen of the Shôgôin temple. Always in this same group of initiation, shugendô has its own initiations except Dempô Kanjô which is given only to the monks: 2 major initiations are given to all the shugenjas which are of the level for it; Katsuragi Kanjo in the Katsuragi mounts, every 8 years and Jinsen Kanjo every 20 years in the Omine mounts. Jinsen kanjô is divided into 2 groups: Those which receive simple initiation and those, rarer, who have the possibility of receiving double initiation known as the Correct place of the hermitage of Jinsen: Jinsen Shô Kanjo. At the feudal time, this initiation always took place at the end of the pilgrimage of summer in the Ominé mounts. Since the Meiji Restoration, it takes place only every 20 years because the sum of material, to take along in the full pilgrimage of the mountains, is colossal. The hermitage of Jinsen is south of MT. Sakka, in the Ominé mounts. It is there that En-No-Gyoja passed the royal sacrament of the Secret Law to his 5 disciples. The last initiation Jinsen Kanjo which took place at the 20th century, proceeded as usual with the Hermitage of Zenki (4 hours walk south of Jinsen, however fully in the mountains, with shelter from inquisitive eyes) in September 1999; I was there among 200 other yamabushi lay and religious. Details of the ceremony of correct initiation Shô kanjo, in shugendô (transfer of the Buddha Dainichi Nyorai into the body of he who is appointed), are different according each of the schools of Shugendô. But each yamabushi is capable of recognizing in which tradition the shugenja underwent correct initiation; there are secret codes of recognition, as in all initiatory organizations! There is a quality of initiation even rarer than Jinsen Kanjo, in all the esotericism that is Buddhist or Shugen, it is Initiation by Heart: Ishin Kanjo, which can be achieved anywhere, without all of the material required by Jigyô Kanjo. Examples of the Initiation by the Heart : En-No-Gyoja and the meeting with the Master Nagajurna in the cave of the MT Minô, that of the Nichizô Master and Jimpen Dai Bosatsu in the cave of Shô; or that of the Nagajurna Master and the Vajrasattva Buddha in the Palace of iron Stupa. It is an initiation which is apart from space and of time, in a place that only the Buddhas know following intense ascetic periods for the practitioner. More important than a simple initiation, this initiation makes possible a deepening of the close links which link the disciple with the Master of the line. It is for the shugenja, the major exercise that all yamabushi must make, throughout their life. It is through this practice that he receives the teaching of his Masters and instructors. Every year at least, he must renew his energy in the natural mandala. In the Middle Ages, the yamabushi more than today, profited from a pilgrimage per season, with different objectives each time. This differed according to the school : the Tôzan school preferred to carry out the course North towards the South, whereas those of the Honzan school preferred the more difficult course, because of steeper climbs, of the South to North. For all the temples of Shugen from Kyoto and Nara, the mountains sacred for the pilgrimages is the chain of the Ominé mounts; but each school could have its own mountains, like the MT.Aso and Hiko for Shugen Hiko and of Kunisaki in the island of Kyushu; the MT Fuji for Sonshan Shugen, and Mts of Déwa Sazan for the school of Haguro. Each center had its mountain-mandala. Even a temple affiliated to a ‘mother temple’ could also have a training mountain like Makihata zan for the yamabushi of Nigata or Kojima shugen zan for those of the town of Okayama which also attached all to Shogoin. One of the biggest centers, still in activity, is located in the Natural reserve of Mts of Ominé in the peninsula of Kii (Peninsula of the Country of the Trees). 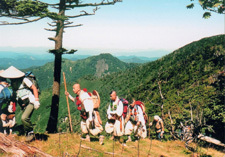 With the mount Sanjo, the Mecca of shugendô, where a monastery has risen up, in full mountains, isolated far from all, where the Zao-gongen Buddha appeared with En-No-gyoja, the chain of the Ominé Mountains offers one initiatory pilgrimages punctuated by powerful tests over several days, during which the shugenja walks in the mountains more than 12 hours per day. A hierarchy exists between Shugenjas which receives different names according to the number of pilgrimages that they have achieved, because the number generates experiences and knowledge. Those which are with their first pilgrimage, the neophytes are named: Shinkyaku; they cannot still wear Yui-gésa with pompoms of the confirmed yamabushi, and those which have experience already with the pilgrimage in the Ominé mounts should not in any case speak of the tests that they have had to undergo. They themselves, on the Rock of Hanging, swear to never speak about it if they do not have permission to do so from the Superiors of the Order. Shinkyaku must remain in the total ignorance of what they will have to undergo in the real test! Once this first pilgrimage is achieved, they receive starting from the second pilgrimage the title of Sendatsu. There are ranks, according to a number of pilgrimages carried out and years of practice which is noticed with the color of Yui-Kesa and its pompons(light blue and marine blue for the beginners) and of the color of the cord which girds the size (yellow for the lay ones). There is a considerable number of names; Jun Sendatsu, (Sendatsu assisting), and for the veterans (at the end of 20 years of practice), they are called: Dôshu Sendatsu and carry of another title: Most prestigious being that of Bûchû Shusei Dai sendatsu. The Great Guides (Dai or Ô Sendatsu, also marked Sendachi) carry different names according to their rank in the monastic hierarchy or of the spots and responsibilities which are theirs during the pilgrimage: Sendatsu in charge of the collecting of wood for the ritual of fire will be called Kôgi Sendatsu; that which will carry water in offering to the Buddha will be called Akka-Sendatsu and the religious, directing dignitaries of the pilgrimage, first of the Rope and Master of discipline will be called differently: Shô (Invaluable) Dai (Great) Sendatsu (Guide) Director of the pilgrimage is named: Ojuku sama, by the whole of Shugenja of the Shogoin temple; Shô Dai-Sendatsu, which knowing perfectly the mountain path (the first of the rope) is named Sakkigaké-Dai-Sendatsu. Those who have taken up this duty for the pilgrimage of the Shôgoin temple are now, from 2008, Rév Nakamura Kakuyu and the Rév Miyagi Taigaku sensei. Reverend Nakai Kyozen * (see photographs), superior of the Kizoin temple, at the village of Yoshino, is retired Ojuku! After 5 pilgrimages in Ominé, one can receive the title of Great Guide: Dai Sendatsu, (with free certificate of the temple to the support), to reveal the lies & boasting of frauds who seek recognition through false claims of practice, who exist in Japan and in the USA. These pilgrimages in a group form a synergy from the group, where the whole process depends on the group energy and intent to gain full understanding and experience. We will consider later the pilgrimages and the asceticisms made as a recluse, because their goals are different. Previously, before taking part in these a preparation of 30, 50 or 100 days was obligatory at the village of Nachi. Everyone leaves the Shogoin temple in Kyoto, passes by the village of Yoshino (in the south of the town of Nara), sleeps with the Kizoin temple, then at the top of the Sanjo mount in the monastery, sleeps the third night with the lodging of the Sumisen mount, then with the hermitage of Zenki and the village of Yunominé (and its miraculous hot springs), after having come to pray in front of the sanctuary of the Waterfall of Nachi and in the sanctuaries of Hongu and Shingu of the town of Kumano. That takes one week, to make this pilgrimage in a group. On the other hand, according to the ancestral rules that are maintained during the pilgrimage, which we will enumerate to you then, most important is always: Each day of the pilgrimage, it is necessary to endeavour to maintain in oneself the burning and pure desire to progress in the way of the Buddha spirit; that is named: Shôshin, the pure spirit or that of the new-born baby. 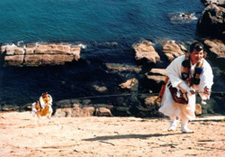 The sexual abstinence (kessai) is required during all the pilgrimage, especially at our modern time where for a few years the women have been allowed to take part and practise shugendô. . Not to drink alcohol (even saké) and not to eat meat go hand in hand with chastity at the time of the pilgrimage in the Ominé mounts. For Shôgoin, it is Sakkigake-Sendatsu which acts as Master of Songs (Kiyoto) and indicates to the individuals the verses of sutra and the prayers with statements at each place where the column must stop in the mountain. Each monk who accompanies the pilgrimage have well defined roles. The apprentice monks (Gâkusô) are in charge of carrying the Master materials as well as their own and also to play the Conch while walking for several hours. Blisters appear at the corner of the lips after this practice. The N°1 of the Shôgoin, the Man-In Dai Sendatsu is The Reverend Tainen Miyagi! He is the actual Gomonshu Sama of the temple Shôgoin and headmaster of the school Honzan-Shugen. 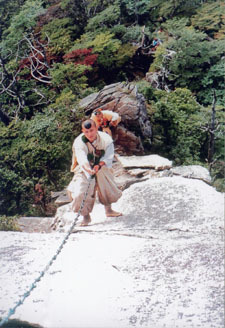 Reverend Nakamura and Reverend Miyagi are the only 2 Yamabushi to climb the "rock of equality" (Byobu-iwa) at the top of the Sanjô mount, one on one with the vacuum, back stuck to the rock face, depending only on themselves to keep their heels in place! The "Big Complete Master" has all authority of decisions (in Shugen), even the right to adapt the practice rules to the modern era. Never lose sight of the fact (that by stopping unhealthy thoughts) it is Me that becomes the Buddha. Never to be impolite with regard to the Directors and the Veterans. Not to be indolent with respect to the tasks that are to be carried out each day. To conform simply to the orders of the Directors and Masters and not to wish for the Major Law (Secret Teaching) with a disordered spirit. To take the advice of the Veterans and to not always act according to your own feeling. Not to break good manners and to accept insults from the Elders. Not to touch on the frivolous subjects, not to amuse with laughing at useless words or grievances. Respect the regulations of the Directors and the Veterans. Not to allow useless discussions. If the discussion exceeds the limits for which it is intended, one cannot allow it. On level ground not to fall asleep while largely yawning (In all Japan the yawn is very badly perceived; a popular belief even says that the heart could flee the body by the yawn). Not to chatter while entering the mountain with the neophytes who have not practised yet. Not to cut wood for oneself in a radius of 650 meters (6 Chô) around the refuge (not to impoverish the forest around the refuge) However the collecting of the deadwood is not prohibited. In feudal times these were read each day so the neophytes could retain them well. One never reflects the tiredness, tests and drudgeries that are faced along this pilgrimage, challenges which continue to discourage the least robust or most boastful people. In Haguro, Yamabushi living close to the temple, during the weeks which precede the autumn pilgrimage in the mounts of Déwa-Sanzan and with the Kotakuji monastery, meet to carry out the preparation of material of clothing and the equipment necessary for the pilgrimage. For Muiné-iri in the Ominé mounts, they are the monks of Shogoin who prepare in the temple of Kyoto all the material necessary. Nevertheless, the purchase of the costume * of yamabushi (worn by ritual which is essential for all shugenja considering its comfort and its utility) remains the responsibility of each one according to his rank and capacities (financial). "To put on the clothing of Yamabushi, is to put on the personality of the Fudo Buddha" something always practiced by the shugenjas. It is a tradition, very practical in the mountains which has not changed for more than 1000 years. Traditional clothing may be seen as uncomfortable by the majority of the foreign neophytes, at the beginning, the costume appears as a true Master who teaches us important things in mountain. The clothing of the yamabushi is a true Master-Teacher for the shugenjas. To incorporate all its symbolism, the yamabushi have a meditation on the symbolism of each part when they get dressed. A yamabushi does these as he dresses in less than 10 minutes in the mountains. We will now list the principal articles which constitute the dress of yamabushi at the time of the pilgrimages in mountain, in group or isolated. 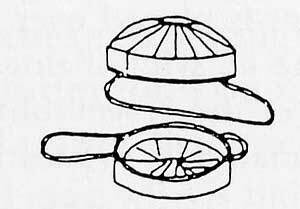 Tokin: It is a small cap carried on the front of the cranium, which symbolically recalls the lotus on the top of the head of Fudo and which makes it possible for the yamabushi to protect the head when they pass under roots or trees. It can also be used of cup for drinking or to offer water to the Buddhas in mountain, where material is always missed. Its particular form is filled of symbols that all shugenjas must know. There exists a small black tokin, made out of plastic now, or enamelled very hard and very light paper more comfortable and practical in mountain. It symbolizes the lotus which is on the top of the head of the Fudou Buddha. When in town or during the ceremonies, the yamabushi can wear another cap: Eboshi (cap of the wing of the crow) the black cap of En-No-gyoja, which has several folds like a Swatiska and a small protuberance to return the plait coiled on the top of the head. They can also carry the cap of brocade with broad sides to the shoulders (Nagai-tokin, long Tokin) not very practical in mountain, it is the usual cap of the Masters of the esotericism in particular and the whole of Mahayana in general. Hangai or Ayai-kasa: It is a hat braided with fine wood slats of cypress, very light, against the rain or the sun. Symbolically, it represents the halo of the Buddhas and Bodhisattva. It represents the matrix of Taizokai mandala whereas the cords used as fasteners are symbolically the umbilical cords which attach us to Mother-Nature. 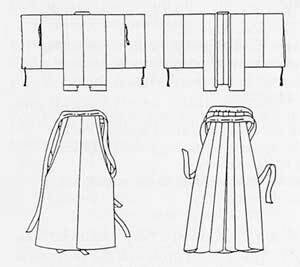 Suzukake and hakama: It is a jacket and a divided skirt whose cut has not changed since the Heian time. At the beginning it has been a lay clothing, worn by the nobles of the court of Kyoto, then by the whole of the nobility of the caste of the warriors since the Kamakura time and by all the yamabushi for 1000 years. It is made out of cotton for the beginners, silk for the "ritual garments" at the time of the ceremonies with Kyoto or in flax and hemp to go in mountain. Light, quickly drying after the dew, at the time of walk, the color is often ochre-orange, color of the egg or the amniotic liquid. The jacket symbolizes Kongokai with its 9 parts and the trousers Taizokai with its 8 folds. Yui-gesa (or Fudo-kesa, Bonten-kea or Machikon-kesa): The kesa is the large buddhist toga of the monks, the clothing monastic designed by the Gotama Buddha starting from 9 bands of menstrual linen bent in only one roll of material. This fabric little practises in mountain, where it would tear easily with the rocks and the branches, was folded in only one fabric band to which one added 6 pompoms to symbolize the 6 virtues. It is a pectoral white (Shiroi ginran bonten kesa) for the monks and chestnut (Cha hiro ginran bonten kesa) for the lay practitioner, with reasons encrusted out of gold with sheets with Ginko-Bilobab (symbol of asceticism in the Honzan school). The color indicates the rank: Marine blue for the lay beginners and white in the confirmed religious ascetics who practise the difficult retreats (hara-gyô, between 100 and 1000 days). In all the Schools of shugendô, all the yamabushi can be recognized at first glance from a distance by the Kesa worn before even exchanging the first codes of membership of the group. Moreover there is a brotherhood between all the schools of Shugendô: Shugen Kosyukai which gathers Shogoin, Sanpoin, Shozenin, Kimpusenji and Tonanin, Kizoin, Sakuramotobô, Chikuriin, Ryusenji, the sanctuaries of Nachi and Kumano, various affiliated temples of the province of Yamato (Kansai; Kyoto, Nara, Wakayama, Osaka and Mie), of Kanto (area of Tokyo), and of Kyushu and others without distinctions of class nor of doctrines in order to preserve and to preserve intact the teaching and the study of Shugendô. In Shugendô Bonten-kesa is a sign of recognition and membership. This is the collar of the Fudou Buddha. 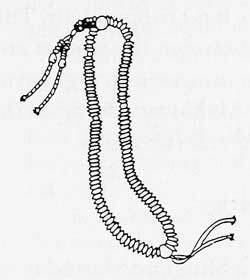 Hirataka-nenju: It is the name given to the special rosary with 108 beads employed in shugen. It goes around the neck only in mountain, for in the natural mandala, one is not more supposed to be in Sangha. Otherwise the yamabushi always carries it rolled up in 3 turns to the left wrist. Used as a counting frame it makes it possible to count the number of mantra recited at the time of the jappa (recitation of mantra in an uninterrupted way). The beads symbolize passions which one polishes all day through perseverance and practice. Hôragai: The "Conch of the Law" plays the same part as the bugle of the military formations. In addition it moves away the dangerous animals like wild boars, the bears or the stags (formerly wolves). It invites the men to gather, it announces the departure or the arrival to the lodging, the beginning or the end of a rite. It can emit between 3 to 5 notes only made by setting the lips differently. Each school of shugen has its own melody phases, which makes it possible to be identified in the mountains without having to speak. The conch is the instrument carried by the Indian god Vishnou, it is heard in the 3 worlds. Its form resembles the sanskrit letter BAN, symbol of Dainichi Nyorai in Kongokai mandala. It is the monk Kukai who it first brought it back from his stay in China. To be able to blow for hours at a time during the pilgrimage of "the entry in mountain" in Ominé develops the breath considerably and gets incomparable mystical experiences, the major sound of the conch reflecting on bodies pineal and pituitary brain if one learned how to blow as it is advisable in shugendô from a Master of the art of the conch. During the years in Shôgoin, it was my work, to learn how to blow in the conch with the apprentices young monks. Its training is long, tiresome and painful nevertheless with a good instructor, it takes six months to control the melodies with 3 notes, several years for the 5 notes of the Tôzan school. Like all the Masters of Conch, I studied the 4 ways of blowing (with their melody sentences) of the 4 large schools of Shugen. And even if the esotericism Shingon and Tendai uses the conch at the time of the processions and parades, they are far from equally the magnificence of the art of the conch by as practiced by the Yamabushi of Shugendô. Shakujô: The wand or short stick with rings, it was invented by the Gotama Buddha to indicate the presence of the monks in front of the residences of which they were going to make the asceticism of the begging. It is carried by the yamabushi with the belt in mountain to control the rhythm of the readings of the texts and sutra like the drum. 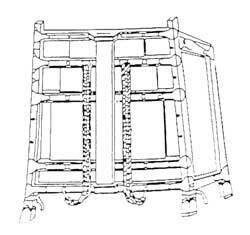 Oi or enkyu: It is a portable trunk with 2, 3, or 4 feet, to be able to set it on the ground without dirtying it. It was either the light braided bamboo or heavier enamelled wood. It was used for the yamabushis to transport a statue of En-No-gyoja or Fudou (or others according to the particular worship which they chose). It was kept on the back thanks to straps similar to those of a backpack. At medieval times, the yamabushi always had this at the time of his peregrinations, all the more so in Ominé "to reload it". But now this trunk is not used any more except for show at the time of the processions which precedes a ceremony of Walking in Fire (Saito Goma) downtown. In the mountain, it became cumbersome since it is necessary from now on to go very quickly! Its dimensions are symbolic and point out certain aspects of the doctrines of Shugen. Kata-bako: Literally "Box on the shoulders". It is a rectangular box, that is set on the portable trunk, which contains the prayers to be recited to the divinities, the lists of the persons in charge and the participants, ink, the brushes to write and paper sheets and various usual objects. The katabako was often used as lid with the portable trunk. It was closed by a sacred knot (tama-musubi) indicating the confidentiality of information which it contained. Like Oi, it is also not employed anymore, but solely at the time of the parades for the ceremonies; Directors of pilgrimage now preferring the use of the back bag, more practical for fast displacements. Kongo-zuè: It is the walking stick. It is of different length and form according to the rank and the responsibilities. Made of a simple dead branch for the neophytes who will leave it behind in the Ominé mounts at the end of the pilgrimage; it is octagonal for Sendatsu or perfectly cylindrical for the Directors. These 3 models are always present. Symbolically it is the Lightning-diamond which is the Master who leads on the path of the Awakening. During feudal time its robustness when made of oak or cypress, often transformed it into pole to carry water and wood. It measures 1m 50cm for Sendatsu, and 1m 80cm (6 shaku) for the Directors. Sakki-Sendatsu, must use a little particular Kongo-zué to that contained a sharp-edged spear end (Shikomi-zué) in case the passage of the column was barred by an animal made insane, such as a female bear with cubs, or wild boars charging because a demonic spirit has made them insane (Goryoé). Hisshiki: It is a piece of goatskin, deer or bear which makes it possible to sit down in these Japanese mountains which are permanently softened by the rain. It keeps the bottom of the back warm and thus avoids catching chill and allows sitting down, protecting the back of the legs. Although we are Buddhist, the Hisshiki is second in importance only after the sandals of straw in my recommendation of items to carry in the wet mountains of Japan! This square of skin symbolizes the skin of the lion on which the bodhisattva Fugen sat. It symbolizes also passions which all yamabushi must control. 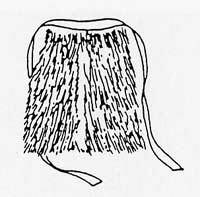 Kyahan and Tekko: The leggings and mittens protect from the scratches, and make it possible to make the divided skirt usable in mountain. The gaiters protect from the leeches at certain places of the pilgrimage. There are 2 symbolic types : for the pilgrimage of spring and another model for the autumn. If a yamabushi puts on gaiters of black colour, that means that he is involved with "genkrabé" (contest of capacities) of "fast walk on the clouds!" Hiôgi: The special fan made of wood plates of cypress is very much used to poke the flames at the time of the ceremony of fire. Shiba-uchi (Hôken): It is a sword, resembling the sword of Foudo, carried by all the yamabushi before the abolition of the carrying of the sword in Japan, under the pretext of being used to cut wood. It is not any more in use today but for the ritual of the Sword of Sapience in Great Ceremony of Fire Outside (Saito Dai goma kuyo). At present in mountain, Yamabushi have their personal knife which they use only in the event of extreme need because the presence of blade on asceticisms is supposed to ruin the goals of these last. 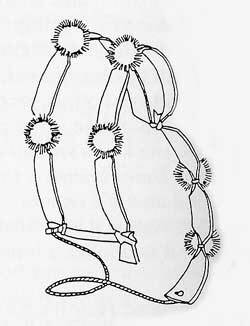 Hachi-nawa or Kainô: These are two cords carried specific to the size which is needed to ensure safety at the time of the dangerous passages above the chasms. It is the umbilical cord of Fudou. It is is yellow, violet, red, chestnut or white according to the function and the rank. Yatsume-waraji: They are the sandals in straw with 8 eyelets of Shugendô. Difficult to support at the beginning because the feet are not accustomed to be treated harshily in modern times. Waraji offer a perfect adherence in rainy weather on the slipping rock, the straw inflating water, fact statement in Yamabushi: "the straw sandals are for the feet during practise, like the lotus’ are for the feet of the Buddhas". In modern times the craftsmen who made them have been lost (in old times with these sandals one could traverse 60 kilometers), and have we have replaced the straw sandals with sandals made from fabric which actually damage the feet on the mountain lanes! Couple roks inside bay of Toba, with Mt Fuji at 500 kms, inside the new sun.. It was in 538 that Buddhism was introduced to Japan by King Syong of Korea, as a gift to the Emperor of Japan. The first Buddhist sutras which were in the hands of religious Japanese, the Shamans shinto, contained formula magic (darani) as that of sutra of the Queen of Peacocks (Kujaku kyo), then it was the turn of Hokké-kyo, then of Shomankyo, Muryojukyo, Urabonkyo, Yuimankyo, Ninô-Hannyakyo, Yakushikyo, Dainichikyo, etc... to contain magic prayers. These prayers were used by Shamans to make rain or by other types of Shaman to heal. Shaman and witches that still use them to cast magic spells continue to abound in the rows of Shugendô today! One of the best ways to introduce Shugendo is to focus on mountains austerities, which are the most important rituals in Shugendo! According to the doctrine of Shugendo, the object of mountain austerities is to become a Buddha in one's human body. In others words, the purpose of mountain austerities is to transform a profane man into a "sacred man" by mystic training at sacred mountain. "Wandering in mountains can be an ascetic practice..." said the ascetic of India, Jishun Milarépa; one of the master of Kagyu school of Tibetan Buddhism. We can divide mountain austerities into 3 elements: the first is the mountain as a sacred place. Not only in Shugendo but also in all Japanese religion as a whole, mountains are considered to be sacred places. The mountains are viewed as the dwelling place of spirit of the death and ancestors’ spirit. Tombs are built on mountains. In Japan, the procession to the place of burial is called "going to mountains" (yamayuki). In the ancient times, the tomb of the Emperors was called mountains. These customs are evidence that Japanese people perceive mountains as dwelling place of spirits...In particular, caves, peaks and valleys are feared as dwelling places of these spirits...mountains are believed to be the "other world". A spirit of the dead has been worshipped by his descendant during 33 years becomes a deity (kami), a protector of the family! Second element, mountains are regarded as limited space between this world and the other world. The mountain is an avenue to Heaven and the cave an entrance to an other world... The living beings on a mountain have also profane and sacred characters... Third element, the mountains possess the same character as the cosmos. Mountain is the "Axis mundis". The keys to understanding the Shugendo as a popular folks religion are numerous. The Professor Miyake Hitoshi, scholastic Japanese specialist of Shugendo, speaks about 13 division of understanding. However, much of the information concerning the Shugendo rituals is hidden behind the veil of oral and secret transmission (denju). Thus these activities have been inaccessible to academic research through normal research methods. consecration ceremonies (kwanjo) Shugendo, as a movement very much influenced by Esoteric Buddhism of Vajrayana, involves a great variety of consecration ceremonies. The central and most important consecration is called the "Sho-Kanjo". This ceremony is running every 20 years inside the mountains at "Jinsen" hermitage in mount Omine in Japan. It is performed on the assumption of the shugendo practionner has passed through the "10 realms" of existence, from hell to Buddha hood during the practice in the mountains, and it symbolizes one's final attainment to "Buddha hood in this body" (sokushin-jobutsu). Commemoration rites (Kûyô-hô) By "commemoration rites", I refer to rites of worship whereby the practitioner or believer express his reference toward certain deities through the chanting of the sacred texts (sutra) or other offerings. We can classify the offerings in 3 types: -A) offerings of respect, such as decoration and cleaning the worship hall (kei-kuyo) -B) offerings of action, such as offerings of the sutra and performance of worship (gyo-kuyo) -C) offerings of "benefit", such as offerings of food and water to the deities (ri-kuyo) The central Shugendo "offering" is performed for Acalanantha Buddha (Foudo Myo), in which the presence of this Buddha is solicited, offerings are made, and the practitioner becomes symbolically identified with him. Fortune-telling and divination (bokusen) Yamabushi/shugenja are involved in many types of fortune-telling and divination, from the analysis of good and bad days of the calendar; yin-yang divination (ekikyo), the determination of lucky and unlucky directions (feng-shui), divination of a person's fate through astrological signs or guardians deities on the person's birth date, and so forth. the art of obtaining oracles through mediums (fujutsu) I addition to the aforementioned methods of divination, some Yamabushi/Shugenja obtain oracles by acting as mediums, calling on the spirits of some gods or Buddha to possess them and gives oracles. However, I believe that the shugenja as medium is marginal role within shugendo because there are many medium/shaman outside of shugendo. But it is often difficult to draw the line with the shaman mediums that are affiliated with shugendo and those who are not! Prayers of possession (yorigito) This is a peculiar Shugendo form to obtain oracles. In these rituals, the Yamabushi uses a medium as a vehicle for the possession by a deity, which is then asked to reply to various queries or requests concerning the next harvest or one's personal fortune. Fire ceremonies for advertising misfortune (sokusai-goma and saito daigoma) The goma fire ritual is a form of Shugendo deep prayer. A certain liturgy is performed; including various chants, before and while the fire is burnt. Offerings are burnt in the fire for the object of worship, usually the Buddha Fudo Myo, and prayers are offered for the realisation of certain requests. The "saito goma", outdoor big fire ceremony is a fire ceremony unique to Shugendo. This ceremony is the central part of major Shugendo ritual during, before or after the pilgrimage in mountains. Rituals centred on various deities (shosonbô) In addition to fire ceremonies, shugendô rituals include many ceremonies utilizing gestual of hands (mudra in skt, inzu or shuin in jp), and spells (shingon in jp, mantra/darani in skt) and mandara (mandala) for the purpose of realizing the attainment of one's prayer. These ceremonies address certain deities: as Buddha of medicine Yakushi Nyorai as protector of Land or Amida Nyorai, the Lord of dead world on the west side...or bodhisattvas as Manjusri, or Kokuzo, the Lord of Space, various forms of Avalokitesvara, or some fierce angry deity as Fudo Myo, Indian deities as Sarasvati (Benten) or Agni (Katen en jp)...Japanese gods with a Buddhist forms as Inari or Hachiman Daimyojin, Kôjin... and examination of the ceremonies listed in shugendo manuals shows that these ceremonies are most often addressed to the class of Vajra as Fudo Myo or Indian deities. Incantation or benediction (kaji) The word "kaji" (benediction) is often combined with the word "kito (incantation) to form the word "kajikito" and in the popular mind this is the believed to be the most common activity or social function of a yamabushi/shugenja. However "kaji" and "kito" are not the same. "kito" refers to the prayers or rituals incantations offered to a deity as a form of request in a ceremony as fire ceremonies or others. "Kaji" refers to the identification (ka) of the yamabushi/shugenja with the deity in order to realize (ji) a certain purpose. Therefore "kaji" is a religious ritual wherein the shugenja achieves identification with the deity and manipulates the power thus obtained in order to gain certain benefits. Exorcism (tsukimono otoshi, chôbuku) Shugenja also perform rites of healing by: giving "energy"... or by determining the cause of a disease (such as a spirit of an evil deity, the dead, or a possessed animal spirit) and then perform ceremonies to exorcize these bad spirits. 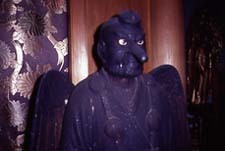 Shugenja were well known as figures that could control or manipulate such spirits of possession (tsukimono otoshi). There are some cases of possession, however, that cannot be resolved through simple ceremony of "tsukimono otoshi" and require the more demanding ritual of exorcism called "chôbuku" (subduing of spirit). An example of this ritual is the "kuji-hô" (ritual of nine letters) practice that utilizes nine mudra and nine formules to draw on the power of supernatural deities. This ceremony is based on a Taoist practice but is one of the most fundamental practices of Shugendo. Spells and charms (fuju, majinai) Finally, shugenja utilize various forms of charms and spells in response to simple requests by people for healing, safe childbirth, and protection from theft, and so forth. These spells are simpler than aforementioned prayers and incantations, often constricting of a short phrase (the gist of a sutra, an esoteric formula, or the name of a deity) written on a small amulet. These amulets are carried by the people in their pocket or around their neck, or placed somewhere such as on the own in a house, in order to divert misfortune or solicit good fortune. The individual religious rituals of Shagged outlined above have the following interrelationship within the total structure shugendô rituals. 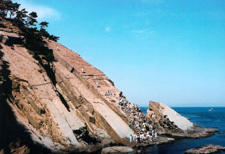 The primary shugendo ritual are those associated with the pilgrimage of "entering in the mountain" and consecration, through which shugenja achieve identification with a deity and manifested to the shugenja's followers through rituals as "genjuutsu" (for example walking fire ceremonies), the demonstration of magic-religious powers. The identification and communication with deities continue in the rituals such as "kuyo-hô" and various activities connected with the festivals. On the basic of these preparation, shugenja respond to the request of their followers by performing divination and the art of obtaining oracles through mediums to avert misfortune by clarifying the causes of these misfortunes, whether evil deities, evil spirits or unlucky stars. Evil influences are removed and blessings solicited through the performance of fire ceremonies (goma), rituals centred on various deities, and services for the heavenly body and small shrines. At others times evil deities or evil spirits are exorcized. Other accessible means for averring misfortune or soliciting blessings include benediction or incantation, charms, and spells. Rituals for the purpose to achieving identification with the object of worship: rituals during mountain pilgrimage, consecration, the demonstration of magical powers, and rites for the angry Buddha Fudo Myo . Rituals for the purpose of communication with the object of worship: Chanting sutra, festivals for the deities. Rituals as means of achieving identification with the object of worship: Divination, obtaining oracles through mediums, prayers of possession, "goma" fire ceremonies, rites for deities, benediction and incantations, exorcism. Rituals to achieve the power to manipulate these deities: Prayers of possession, "goma" fire ceremonies, benediction and incantation, exorcism, charms and spells. Rituals to receive oracles: Divination, oracles through mediums, and prayers of possession. Rituals of prayers: Service for the sun, moon, stars and small shrines, "goma" fire ceremonies for averting misfortune, rites for various deities. Rituals of exorcism or removing evil influences: "kaji-kito", incantations, removing a possessing spirit, "defeating" spirits, charms and spells. The supernatural spiritual world of Shagged contains a large syncretism of Buddhist pantheon of various Buddhist and animist deity, Taoist practices and shamanism rituals. Shugendo is a melting pot of local beliefs of Japan with Chinese mixed with Indian practices to make an universalistic cosmetology.